I’m considering renaming this blog ‘Cecelia Ever After.’ Well, not really. BUT. The number of fairy tales retellings in my to-be-read (TBR) pile is… getting out of control. I can’t seem to help myself whenever I see a new one pop up. Example: R.C. Lewis’ debut young adult novel Stitching Snow. There I was at the BEA Bloggers Conference, minding my own business, when I saw that title and cover. Immediately, I suspected fairy tale retelling. The ARC might have been in my hands even before my mind finished making the connection. That turned out to be a good life choice*, because it's a can’t-put-it-down genre mash-up of a book (a.k.a. fun times). Essie is a tough-as-nails teenage mechanic making her way on the ice planet of Thanda by repairing mining drones. Princess Snow is a long-missing royal heir from Windsong, the most powerful planet in the star system. Dane is a young man who crash lands a Garam shuttle onto Thanda, ostensibly in search of ‘treasure.’ And none of these young people are exactly who they seem. However, their actions and adventures will decide the fate of their planets – if they can survive assassination attempts, kidnapping, and double crosses. Buckle up! Stitching Snow is a planet-hopping sci-fi adventure for a generation that grew up watching Star Wars. It’s the story of unlikely heroine Essie, who pays for spare parts for her drones (and lost boy Dane’s shuttle repairs) by cage fighting on the icy planet Thanda. Seriously, one of the opening scenes is a cage fight! From there, the story marches on to Garam, a desert world with protected bio-domes and advanced tech, and there are two more planet-hops before the end of the story. All of this movement is aided by non-stop action and political necessity, so that the pace feels urgent, even breakneck in spots. Unfortunately, the never-ending action leaves… let’s call them gaps… in believability and world-building. Some of the things you have to take on faith: 1) Two teenagers can effectively infiltrate a military/government compound, 2) A girl can remember and understand nuances in relationships/politics from a childhood situation that she hasn't been immersed in for years, 3) Same girl who was betrayed by family at an extremely young age immediately trusts strange boy, 4) Being a royal is pretty simple to pick up, and 5) There weren't any retroactively-planted listening devices. Most of the above won't make sense until you read the book, of course. The good news is that the reader can overlook most of it because: entertainment value! 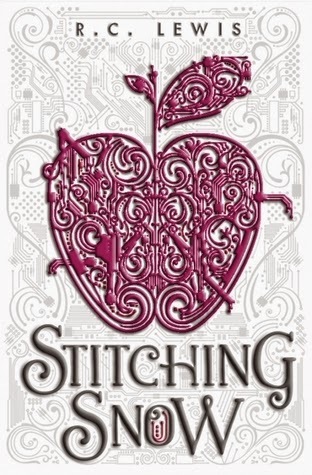 Though Stitching Snow is supposedly a Snow White-gone-science-fiction retelling, I'd say it has a different flavor. It has some of the trappings of the fairy tale – apple, dwarves, jealous stepmother – but it's mostly a political thriller set against the backdrop of a star system. It also draws from other tales and traditions, and includes a sadistic king who plays with others' lives and a rebellious group, the Exiles. My favorite character/bit of scenery was the drone Dimwit, who combined the best of Star Wars' R2-D2 and C-3PO, and was set up as the adorable sidekick early on, alongside another drone, Cusser (who provided comic relief without the need to even say the requisite 'cuss words'). One of the things that R.C. Lewis did well was to write dynamically. The book starts with that cage fight (a great hook! ), and even when characters are training or talking or engaging in other downtime, the flow remains constant. Another thing I liked was Lewis' mix of future tech and the archaic. Sci-fi lets you play a bit with advancements in tech and/or traditions, but Stitching Snow had a good balance between things that may be automated, and what will remain manual. This helped integrate some of the expected 'fairy tale' trappings as well. A third 'like' goes down to the fact that this is (as far as I can tell) a stand-alone. I could see places where the story might have been teased out into a series, but I'm very glad it wasn't, for both the pace of the book and on the romance side of things (oh yes, there is a bit of romance...). In all, Stitching Snow was a fun YA sci-fi novel with political games, near escapes, assassination attempts, kidnappings and cage fights. Oh, and a nod to fairy tales. Everything I like (everything exciting!) all in one place. It wasn't perfect, but I enjoyed it, and I think it will be very popular. Recommended for: fans of Marissa Meyer's Cinder and Star Wars, and anyone who is partial to light science fiction, stories with breakneck pacing, and heroines who are smart and tech-savvy. *Other good life choices include (but are not limited to): eating salads for lunch, participating in a real-life book club, and maintaining a sense of humor while riding public transportation. Stitching Snow will be released by Disney Hyperion on October 14, 2014. Fine print: I picked up an ARC of this book at the BEA Bloggers Convention in May. I received no compensation for this post. I love fairy tale rewrites too. What a gorgeous cover! And no judgment here for reading a ton of fairy tale adaptations. I cherish them. I really like fairytale themes. One of my favorite books Graceling(it's not about a fairytale, but it's really cool). I'm reading Cruel Beauty by Rosamund Hodge. It's beauty and the beast inspired. It's really good!